@ @gamussa @sfjava @confluentinc Who am I? @ @gamussa @sfjava @confluentinc Solutions Architect Who am I? @ @gamussa @sfjava @confluentinc Solutions Architect Developer Advocate Who am I? @ @gamussa @sfjava @confluentinc Solutions Architect Developer Advocate @gamussa in internetz Who am I? go follow me in twitter © Who am I? 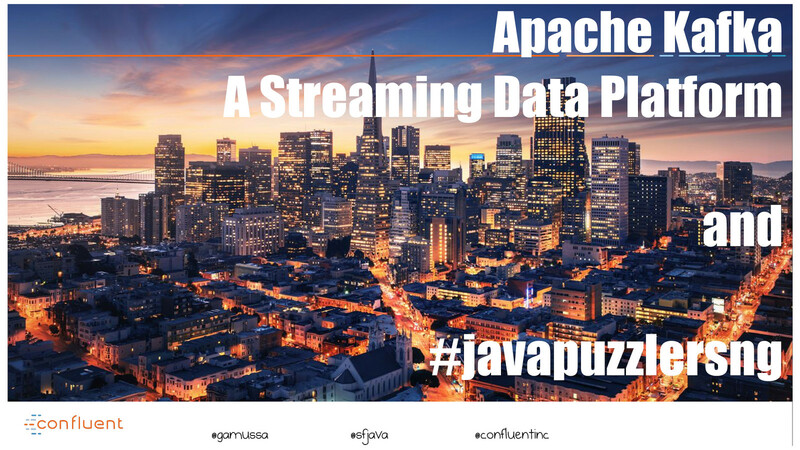 @ @gamussa @sfjava @confluentinc authorization_attempts possible_fraud What exactly is Stream Processing? @ @gamussa @sfjava @confluentinc CREATE STREAM possible_fraud AS SELECT card_number, count() FROM authorization_attempts WINDOW TUMBLING (SIZE 5 MINUTE) GROUP BY card_number HAVING count() > 3; authorization_attempts possible_fraud What exactly is Stream Processing? @ @gamussa @sfjava @confluentinc Streaming is the toolset for dealing with events as they move! View Apache Kafka — A Streaming Data Platform on Notist.